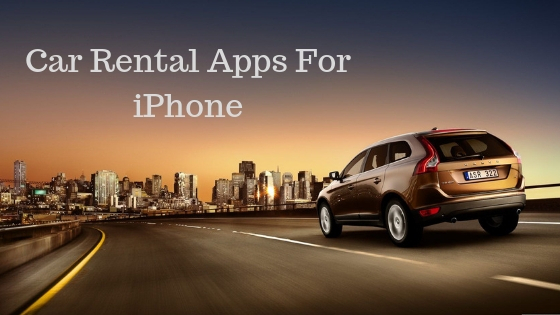 Are you searching for best Car Rental Apps for iPhone to travel easily? Then you are at right page. Tech Untouch created a list of top Car Rental Apps for iPhone. Instead of Taxi, renting a car is a more preferred option for long distance traveling. Gone are those days when you have to go to the office to rent a taxi or book it in advance. Today rent a car even easier than walking in the garden. Many car rental apps provide you best car deals with easy booking process even on busy days of holidays like Christmas. When you are driving your rental car, you don’t have to guide anyone; you are the king of your car. And with your friends and family, you can enjoy the trip without awkwardness and irritation. So let’s take a look at the cheap car rental app. Getaround is an app to rent a car without any hassle or waiting. Even there is no need for paperwork. You can hire a car from a variety of choices that is from Toyota to BMW. All car can be unlocked with your iPhone. You can get this app for free, and even there is no monthly, annually and hidden fees. Getaround gives you a car with insurance for every trip for a stress-free road trip. Zipcar car rental app is one of the best options to rent a car quickly. You can rent the car on an hourly basis as well as a daily basis. Even there is the option of gas and fuel with insurance. Again here also you can choose from van, sedan, hybrid and more. It is available in 26 different languages across the various cities of US. Once you use the app, you can get a clear idea of it. If you want to be a member of this service, then it can be done with $6 per month. The rent of the car is $ 8-10 per hour. RelayRides by Appvita is peer to peer marketplace to rent cars. You can get a car on a daily, weekly and monthly basis with the rent of $25, $125, and $400 respectively. It provides insurance for each trip and 24/7 roadside assistance and support. It covers about 15000 cities so if you are not even in a big city then also you can find RelayRides available in your area. With Turo, you can easily rent any car as per your preference as it is one of the largest and best car rental apps. You can find the cars from the local community of Canada, UK and US. yOU WILL FIND ALMOST ALL TYPE OF CAR WHETHER IT IS VM bus, Jeep, F-150 truck, or Tesla. As the company gives insurance of the cars for the trip, so there is no tension to the renter or owner. It charges you almost 30% less than the traditional agencies because you are hiring from local car owners only. Car rental is another name in our list of car renting app. The service is the best, and the app interface is also simple. You can quickly book a car as well as compare the prices of all major car rental service providers. Through the app, one can book, view, resend and cancel the ride and get as well as send a confirmation email. You can do all the above processes from the web also. You will get online roadside support. To use this app, I think the language barrier will not come in between as the app supports 28 different languages. If you are exploring for the best car rental experience, then the Silvercar app is the best option for you. Not don’t wait or search the car, book in advance and get the car from your desired location. Get the car and go to your destination. There is no need for paperwork or no booking in well advance. Whenever you need the car, sign in to the app, book the cab and done. Easy! With the car, you will get Bluetooth, WiFi, SiriusXM satellite radio, leather, in-dash navigation, and heated seats without any paperwork! You will get 24/7 on-road support. We are sure that with Silvercar your experience must be memorable. With CarzUP, you will surely get best and cheap service as you can compare all car rental service in one place. You can compare 25 major service provider so that you can pick the best, cheap and quick service. You can find all the facilities provided by the car rental providers. To book a car, no need for a credit card. You can take the car from any station, or airport or within the cities of USA, Canada, and Europe. Before you confirm the booking, you can decide from the pictures of the car. Besides, with this app set reminds on your phone to get all your booking in one place. Hertz is compatible with iPhone, iPad and iPod Touch as well. The reason behind the app in this list is you can easily book your cab to take for rent. An even if you are offline then also you can see all information related to your reservation. Hertz also provides roadside support and special offers for users. If you are an Android user, then the good news is this app is available for Android users also. Car2Go app let you drive your desired car in the selected cities of Europe with a single account. It does not matter whether you are in Berlin, Rome, Vienna or Madrid, you will surely get a Car2Go rent car. You can use the vehicle within the city as well as worldwide. Avoid any delay and confusion by booking your cars in 30 minutes advance for your trip. With your iPhone, you can unlock the car. Even it can let you view all parking space and home area of car2go in each city. The charges of the car are $0.41 per minute and $15 hourly. This rate includes insurance, fuel, and other charges. Now enjoy your ride smoothly as there is no advance fees or no monthly fees to get the ride with this app. Skyscanner is an app not only for booking a car but with this app you can book the flight, hotels as well as a car by comparing to the different services at any time and anywhere. The plus point of the app is you will get a bigger discount on the booking. Within a few minutes, you can find an appropriate deal and track the booking and payment at one place. This app is also available in more than 30 different languages. It is all about bets car rental apps for iPhone. Now, any of this app you can hire the car and enjoy the hassle-free ride, no worry of disappointment or awkwardness due to the presence of the driver. And it gives you comfort, freedom, and privacy at the same time. What do you think?